Radio X's Gordon Smart was there and gave us his hilarious rundown of the star-studded event. Noel Gallagher had a huge Narcos-themed party over the bank holiday weekend at Aynhoe Park in Oxfordshire, and it's fair to say that it was memorable. So much so, it even caught the attention of Wagner Moura, who plays Pablo Escobar in the hit series, and sent Gallagher a personal birthday message. Radio X's Gordon Smart was among the esteemed guests, who included the likes of Bono, Damon Albarn, Johnny Marr, Madonna, Sir Bob Geldof, Michael Fassbender, The Stone Roses' Mani, Russell Brand, The Pretenders' Chrissie Hynde, Kasabian's Serge Pizzorno and many MANY more. Yep, that's right; you may have have seen the picture Madge tweeted of herself at the bash, but apparently she wasn't even invited! Despite being welcomed with open arms, Gallagher's first words upon seeing the Queen Of Pop were: "Who invited you?" Anyone who's followed Noel and Oasis around the world will also know of the great man, Scully, who was so starstruck, he was apparently speaking to Madonna like she was the actual Queen! Models, actors, supermodels, fellow musicians, roadies and ticket touts all turned out at the event of the year. The star studded list included: Bono, Adam Clayton, Michael Fassbender, Woody Harrelson, Chrissie Hynde, Johnny Marr, Lars Ulrich, Alicia Vikander, Paul Simonon, Helena Christensen, Stella McCartney, Sir Bob Geldof, Matt Smith, Lily James, The Stone Roses' Mani, Primal Scream's Bobbie Gillespie and Andrew Inns, Mike Pickering, Damon Albarn, Poppy Delevingne, Sadie Frost, Kasabian's Serge Pizzorno, Sadie Frost, The Cuban Brothers, Radio X's Russell Brand and Matt Morgan, David Walliams, Hurts' Theo Hutchcraft and more. The party looked lavish and extravagant with amazing art everywhere. Candles bore Noel Gallagher's face on them and a huge flag of Noel Gallagher as "El Presidente" was draped behind the dancefloor in a nod to the Narcos theme. #NoelGallagher yesterday at his 50th Birthday Party. In-keeping with the South American vibe, a mariachi band also welcomed guests at the door. The Comedian and Radio X DJ started off the proceedings by introducing Gallagher's wife Sara, who introduced a little-known Irish musician named Bono. Gallagher came on and told the guests it was actually his "joint 50th" with his wife, Sara, who had been planning the event for ages. The Cuban Brothers then played a belter of a set, getting the party into full swing. Other gifts for the Oasis man included a silk Man City boxing gown, which he apparently spent some time dancing around in. Not content to show-off his writing skills during his tribute to Mr NG, Bono was also spotted sharing the band's latest effort to the Hollywood mega-star. 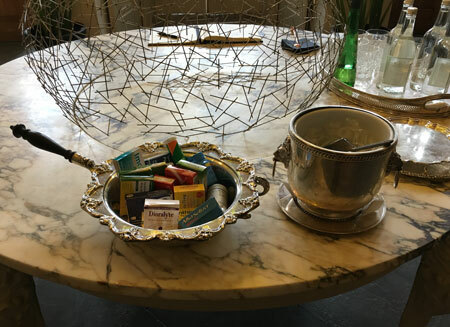 The rock 'n' roll hangover survival pack dished out for the party featured the likes of Immodium, Alkaseltzer and Dioralyte. Yes, according to Gordon there weren't just treats on top of the table, but under it too. U2 flew in from Dallas on a private jet via Dublin, where they picked up a gang of their Irish mates. Apparently, they were all still going at 6pm on Monday - a full 72 hours after the bash had started! Russell Brand holding court stretched out on a leather sofa. An un-named actress setting her boyfriend's suitcase on fire for coming back home, which in-turn set off the fire alarm three times. Michael Fassbender telling Noel Gallagher how the dry cleaning foil was still on his newly laundered shirt. Poppy Delevinge having to be dragged off a giant disco ball in the garden by security after she wouldn't stop swinging on it like Miley Cyrus in her Wrecking Ball video. Man City guests goading Man Utd fan and The Stone Roses bassist, Mani, by singing Blue Moon. 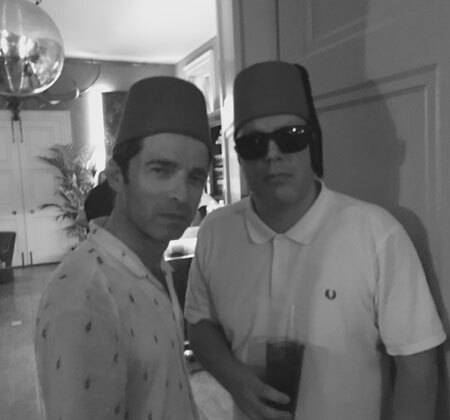 Oh, and Noel Gallagher spending all of the Sunday in a fez.